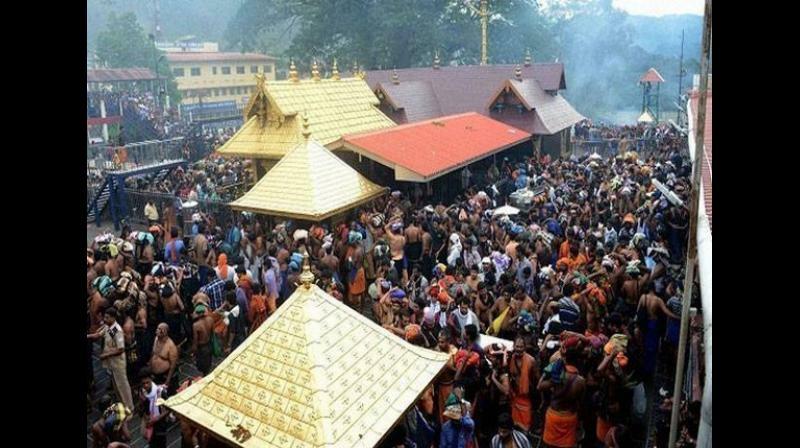 Thiruvananthapuram: As the Sabarimala temple will be opened for five-day monthly pujas on Tuesday, the Kerala police have sought a ban on the assembly of more than four people. The request has been made to prevent any showdown at the shrine during the pujas as an apex body of Hindu outfits has reiterated its plan to block women of menstruating age from entering the shrine. The apex body, Sabarimala Karma Samiti has been opposing the September 28 Supreme Court verdict that allowed women of all ages to worship at the shrine. Pathanamthitta police chief, T Narayanan, has recommended imposition of prohibitory orders under Code of Criminal Procedure’s Section 144, as a warning that the situation may turn volatile again. Section 144 prohibits assembly of more than four people in an area. It provides a three-year jail term for anybody obstructing a police officer trying to prevent an unlawful assembly. The district collector was expected to take a call on the imposition of Section 144 late on Monday night depending how the situation evolves. Two women, Bindu Ammini and Kanakadurga made history on January 2 by becoming the first women of menstruating age after the Supreme Court’s Verdict. The shrine is being opened for the pujas over a fortnight after the 64-day annual pilgrimage season concluded on January 20.